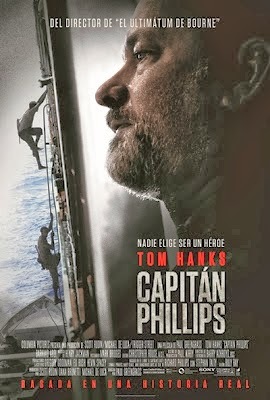 Reparto: Tom Hanks (Capitán Richard Phillips), Catherine Keener (ndrea Phillips), John Magaro (Dan Phillips ), Max Martini (Comandante Seal), Michael Chernus (Shane Murphy ), Christopher Stadulis (Charlie Spotter ), Chris Mulkey (John Cronan), David Warshofsky (Mike Perry ), Corey Johnson (Ken Quinn), Yul Vazquez (Capitán Frank Castellano). Guión: Billy Ray, basado en el libro A Captain’s Duty: Somali pirates, navy seals, and dangerous days at sea de Richard Phillips y Stephan Talty. Producción: Scott Rudin, Dana Brunetti y Michael De Luca. Diseño de producción: Paul Kirby. Productoras: Michael De Luca Productions, Scott Rudin Productions, Translux y Trigger Street Productions.